Western military, intelligence, and journalism are furiously examining Russian Vladimir Putin’s use of hybrid warfare in Ukraine. The limited and stealth-like nature of Putin’s countermoves in Crimea and Donbass after the Western-supported democracy-promotion measures and revolt in Kiev in winter 2013-2014 sparked fear and interest across such establishments. “Putin’s hybrid war” is portrayed by these elements and analyses as a sudden innovation divined by a militarily resurgent Russia seeking to conquer its former imperial territories before moving on the West. In fact, hybrid warfare is largely a Western invention of sorts, but it has ancient roots in partisan war, guerilla warfare, propaganda, and other pre-21st century sources. Moreover, no one noticed Kiev’s own military ‘innovations’ amounting to a mix of a different kind of ‘non-linear’ and conventional warfare measures. Hybrid warfare is a term used to describe a way of warfare featuring the “blurring and blending of previously separate categories of conflict. 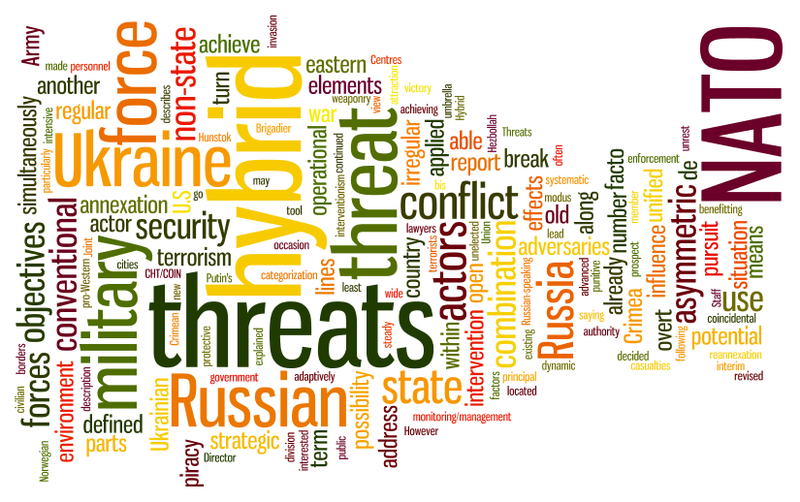 It uses a blend of military, economic, diplomatic, criminal, and informational means to achieve desired political goals” (http://warontherocks.com/2015/04/the-problem-with-hybrid-warfare/). Although “hybrid war” is portrayed in the West as a new development divined by Putin’s militarily resurgent Russia in its quest to reconquer its former imperial territories before moving against the West. In a recent example of the Western genre of “Putin’s hybrid war” Nicu Popescu noted that the term ‘hybrid warfare’ indeed was originally linked to Russia. The term was coined in 2002 by William J. Nemeth to describe however, not some new Russin doctrine but rather the Chechen insurgency led by the ultra-radical nationalist Chechen Republic of Ichkeriya (ChRI) which turned partially jihadist in the late 1990s and wholly jihadist in 2007 under the now possibly defunct Caucasus Emirate (CE). The ChRI and CE deployed “traditional societal organisation and guerrilla warfare with modern military tactics and use of technology – from mobile telephones to the internet.” Popescu also notes that Chief of the General Staff Russian of the Russian Armed Forces Valerii Gerasimov’s 2013 doctrine of “non-linear” originates from “a Western description of Russian military practice, rather than a conceptual innovation originating in Russia.” However, he defers from ultimately designating the source. For example, he notes: “Russian analysts and commentators are quite firm in their conviction that the West, and notably the US, also pursues hybrid tactics – in Afghanistan in the 1980s, for instance, but also over the last decade in the Middle East. Another Russian claim is that the West is carrying out its own hybrid operation against Russia in the shape of smear campaigns and the imposition of economic and financial sanctions. More eccentric though far from marginal views argue that the West’s own hybrid war against Russia was first and foremost conducted through support and alleged instigation of the ‘coloured revolution’ or even the design of the Eastern Partnership and Association Agreements.” But he never mentions the term’s pre-Ukraine crisis Western origins (www.iss.europa.eu/uploads/media/Alert_46_Hybrid_Russia.pdf). “To Moscow, it is the West which led the way in pioneering political-military operations focusing on destabilizing hostile regimes, and it has taken its cues from its sometimes-acute, sometimes-deeply-mistaken perceptions about our thinking. “What has emerged, if not wholly new, is certainly a distinctive way of war, one that is rooted, as discussed in the second part of the report, in response to five particular challenges or conditions with which Moscow must contend, from the mismatch between assets and ambitions, to the deinstitutionalization of Putin’s state. Part three then looks at the particular assets the Russians can deploy in their pursuit of ‘hybrid’ operations short of all-out warfare, from the special forces and thuggish gangster auxiliaries who seized Crimea in 2014 to spies, propagandists and spinmasters” (https://inmoscowsshadows.wordpress.com/2016/11/28/new-report-hybrid-war-or-gibridnaya-voina-getting-russias-non-linear-military-challenge-right/). Today’s hybrid warfare concept is, in fact, a Western, indeed an American innovation. One of the original purveyors of the hybrid war concept is now retired Marine Corps General James N. Mattis. He commanded 2007 until 2010 he commanded the U.S. Joint Forces Command (USJFCOM) from 2007 to 2010. He also served the Supreme Allied Commander for Transformation (SACT) for NATO. He commanded the U.S. Central Commande (USCENTCOM) from 2010 to 2013. As early as 2005 he co-authored with Frank G. Hoffman an article titled “Future Warfare: The Rise of Hybrid Wars Proceedings” published by the U.S. Naval Institute [James N. Mattis and Frank Hoffman, “Future Warfare: The Rise of Hybrid Wars,” Proceedings, (U. S. Naval Institute), No. 131, November 2005, http://www.usni.org/magazines/proceedings/2005-11/future-warfare-rise-hybrid-wars)]. Mattis is now being put forward by President elect Donald Trump to be U.S. Defense Secretary. Going back to Popescu’s claim as to the first use of the term, it is of interest that Colonel Robert W. Schaefer of USCENTCOM noted at a presentation of my paper Getting the Caucasus Emirate Right that his career has been one of organizing insurgencies (Gordon M. Hahn, Getting the Caucasus Emirate Right, Washington, D.C.: Center for Strategic and International Studies (CSIS), September 2011, https://csis-prod.s3.amazonaws.com/s3fs-public/legacy_files/files/publication/110930_Hahn_GettingCaucasusEmirateRt_Web.pdf and “Getting the Caucasus Emirate Right: Global Jihadism in Russia’s North Caucasus” Audio, CSIS Publication Event, CSIS, Washington D.C., 28 September 2011, http://www.csis.org/events/getting-caucasus-emirate-right-global-jihadism-russias-north-caucasus%5D. It is of interest as well that Schaefer is the author of a book about the ChRI insurgency (The Insurgency in Chechnya and the North Caucasus: From Gazavat to Jihad, Praeger, 2011). Whether Schaefer was involved in supporting the ChRI is unclear. Putin claimed in 2016 that the U.S. supported the ChRI insurgency in the 1990s (https://gordonhahn.com/2015/05/06/putin-u-s-intell-assisted-chechnyas-chri-in-the-early-2000s/). The U.S. government never responded to the charge. Moreover, the West’s newly found ally and ‘beacon of democracy’ in the Russian-dominated authoritarian Eurasian landscape – Maidan Ukraine – engaged in its own brand of hybrid war in a war it, to be sure, started against the Donbass rebel movement or so-called ‘Russian aggression’ in April 2014. Indeed, from the February 2014 seizure of power the Maidan regime’s hybrid measures have included: permitting ultra-nationalist groups like Right Sector with impunity to carry out terrorist attacks in Odessa, Mariupol, Torez among other places; establishing quasi-governmental para-military groups such as the newly formed National Guard’s and its battalions staffed to divert and channel the energies of such neo-fascist and national chauvinist elements; using criminal oligarchs to do the same; intimidation of political opponents and potentially disloyal populations (Donbassians); murders and assassinations informally contracted out to criminalized neofascist groups like Right Sector, flash mob attacks, riots and pogroms against demonstrators; conventional and less conventional military operations; and an onslaught of strategic communications, including clearly false propaganda and disinformation equal to Moscow’s. The last involves using – as Moscow, Washington, and others have – all the various means of mass communication in a campaign so massive that there are not nearly enough analysts who could unmask them all even if there were enough who wanted to unmask them. Nevertheless, several of those Ukrainian efforts were unmasked in large part due to their clumsy implementation. The first piece of failed Ukrainian disinformation attempted to show a significant Russian presence in Donbass already in April 2014 in order to blame Moscow for Kiev’s already planned and declared war on Donbass. On 20 April 2014, Ukraine’s SBU provided photographs of an alleged GRU agent to NATO, Western governments, and the New York Times that were ostensibly taken in Georgia, Russia, and eastern Ukraine and purported to unmask a bearded GRU special forces operative who has been allegedly dispatched by Moscow to Georgia and now six years later to eastern Ukraine. Three photographs purportedly depicted one and the same Russian GRU agent in Russia, 2008 Georgia, and April 2014 Ukraine. NATO’s Atlantic Council and the New York Times publicized the photographs, touting them as evidence of Russia’s incursion into Donbass. The SBU’s ‘evidence’ of the GRU presence in Ukraine was exposed immediately as fake. The New York Times and NATO’s Atlantic Council backed off their claims. Simon Saradzhyan of Harvard’s Belfer Center revealed that the photo labeled to have been taken in Georgia shows Khamzat Gairbekov, commander of the Chechen Vostok (East) Battalion controlled by Russia’s GRU and Chechen President Ramzan Kadyrov, sent to fight in Georgia in 2008 and since disbanded. Moreover, the photographer of the photo taken supposedly in Russia said that the picture was actually taken in Ukraine and was used without his permission and that the person in the photograph taken in Ukraine was not the GRU agent Gairbekov but a private Russian citizen named Alexander Mozhaev, who had served in the Russian army in the 1990s (https://gordonhahn.com/2015/08/12/working-paper-violence-coercion-and-escalation-in-the-ukrainian-crisis-and-civil-war-escalation-point-8-civil-war-or-putins-war/). At the same time, Ukraine’s SBU claimed to have captured 20 GRU agents but never presented them to television cameras and never provided audio, pictures of them or any identity papers. Weeks later the SBU reduced the number of its ‘captured’ GRU agents to 10 and days after that to 3 in its falsified report to NATO’s Atlantic Council. Such incontrovertible proof of a significant GRU presence beyond the routine should have been paraded before television cameras. This would have been a real propaganda coup against the Kremlin, but the ‘perp walk’ never came. The Obama White House, U.S. State Department, NATO, its Atlantic Council, US European Command chief General Phillip Breedlove, and the New York Times touted this as ‘evidence’ of Russian forces in eastern Ukraine. Only the last retracted the ‘evidence’ after it was exposed as false (https://gordonhahn.com/2015/08/12/working-paper-violence-coercion-and-escalation-in-the-ukrainian-crisis-and-civil-war-escalation-point-8-civil-war-or-putins-war/). False SBU reports continued through the ATO even after there was reliable evidence that some officially-sponsored Russian incursions had begun in June-July 2014. In February 2015, as the Donbass rebels, with significant Russian military support, were encircling and about to rout Ukrainian forces near Debaltsevo, Ukraine’s SBU passed photographs of Russian tanks allegedly operating in Ukraine to a US Senator who showed them in a presentation on the Senate floor only to have them exposed as fake. Burned already by the SBU’s sloppy stratcomm, the New York Times exposed the deception by showing that the photographs were from the 2008 South Ossetiya war (https://gordonhahn.com/2015/08/12/working-paper-violence-coercion-and-escalation-in-the-ukrainian-crisis-and-civil-war-escalation-point-8-civil-war-or-putins-war/). In February 2015 SBU chief Nalyvaichenko claimed the SBU had evidence that Putin aide Vladislav Surkov had organized and commanded from an SBU base the alleged police sniper attacks that killed tens of civilians on 20 February 2014. Nalyvaichenko presented none of the evidence allegedly possessed by the SBU; he simply said it had such evidence. As documented elsewhere, the preponderance of proof ever since the first days after those events shows that in fact neofascist elements within the Maidan protest movement initiated and were behind many if not most of the sniper shootings, which targeted both police and demonstrators (https://gordonhahn.com/2016/03/09/the-real-snipers-massacre-ukraine-february-2014-updatedrevised-working-paper/). By April, a Rada deputy from President Petro Poroshenko’s party (the Petro Poroshenko Bloc or PPB) revealed that Surkov arrived in Kiev on the evening of the 20th, five hours after the shooting was over. Nalyvaichenko suddenly toned down his story. Testifying at a hearing of the Anti-Corruption Committee in mid-April, he was much more circumscribed in his claims about Surkov. He stated that Surkov was reportedly seen in the company of then SBU chief Oleksandr Yakimenko and visited the presidential administration. Nalyvaichenko made no mention of Surkov coordinating the sniper attacks at the hearings. When the neo-fascist Right Sector group killed several police in Mukachevo in July 2015, the already former SBU chief supported Right Sector’s position. This suggests perhaps that he might have had a role along with the group in organizing the sniper attacks and was seeking to cover this up by pinning the crime on Surkov and the Kremlin. In June 2015, Nalyvaichenko was fired from his position as SBU chief allegedly for failing to fight corruption aggressively. This would not stop Nalyvaichenko from speaking out, including about alleged Russian incursions into Donbass. In July, the earliest official Russian military or intelligence presence in Ukraine he could point to was in May 2014. This was based on information gathered from two GRU agents that Kiev’s forces actually did capture in April 2015 and did parade before television cameras unlike a year prior (https://gordonhahn.com/2015/08/12/working-paper-violence-coercion-and-escalation-in-the-ukrainian-crisis-and-civil-war-escalation-point-8-civil-war-or-putins-war/). In addition to the false claims, Kiev’s more credible disclosures regarding early Russian military presence Ukraine (outside Crimea) never claimed to show, no less did they demonstrate such a presence existed before the 14 April 2014 start of the ATO. Thus, when the opposition Russian newspaper Novaya gazeta consulted the Ukrainian military on Kiev’s and NATO’s claims that there are 13,000 Russian troops fighting in Ukraine and that, according to Kiev, at least 4,500 have been killed as of February 2014, the earliest time for which evidence of a Russian intervention, according to Ukraine’s military, was August 2014, not June or July, no less April. Yet Kiev and NATO were claiming in June that Russia had ‘invaded’ Ukraine. Novaya gazeta concluded that the numerical data for the number of Russian troops and Russian military casualties in Donbass trumpeted by Kiev were not realistic (https://gordonhahn.com/2015/08/12/working-paper-violence-coercion-and-escalation-in-the-ukrainian-crisis-and-civil-war-escalation-point-8-civil-war-or-putins-war/). To this date no evidence of a Russian military intervention or even a significant GRU intelligence-gathering infiltration before late April 2014 has been presented. In other words, Kiev started the hybrid war in Donbass, and that war is fundamentally a civil war. It is as much and, very arguably more Turchynov’s, Nalyvaichenko’s, Avakov’s, and Maidan Kiev’s hybrid war than it is Putin’s or Russia’s. Galeotti points out that ‘hybrid war’ is “a blend of the military and the political, but in fact there are two separate issues.” Two different kinds of “non-linear war” are being conflated by the concept: “The first is the way—as the Russians have been quick to spot—that modern technologies and modern societies mean that a shooting war will likely be preceded by and maybe even almost, but not quite, replaced by a phase of political destabilization. The second, though, is the political war that Moscow is waging against the West, in the hope not of preparing the ground for an invasion, but rather of dividing, demoralizing and distracting it enough that it cannot resist as the Kremlin asserts its claims to being a ‘great power’ and in the process a sphere of influence over most of the post-Soviet states of Eurasia” (my emphases from https://inmoscowsshadows.wordpress.com/2016/11/28/new-report-hybrid-war-or-gibridnaya-voina-getting-russias-non-linear-military-challenge-right/). All true, but again the Western inspiration is lost in the description. On the first kind of non-linear warfare or first aspect of hybrid war, the use of modern technologies in modern societies to spark ‘a phase of political stabilization’ is precisely what Western, especially U.S. democracy promotion (DP) is designed to achieve. Today U.S. government bodies and DP operatives openly seek to foment “political crises” in order to achieve regime change, often overthrowing governments. Thus, a U.S. Marine Corps University Journal examined DP’s “international dimension,” which in addition to “coercive” and “intrusive” measures in support of creating democratic regimes in authoritarian states also discussed more benign “prodemocratic public diplomacy.” Author Alessandra Pinna noted that this form of DP is “combined action of government agencies and private partners” that seeks to “mobilize the public in ways that support interests and policies of foreign states” within the target state. Its “essence” is “strategic communication,” which “aims to capture the hearts and minds of the general public in recipient countries” (See Alessandra Pinna, “The International Dimension of Democratization: Actors, Motivations, and Strategies,” Marine Corps University Journal, Vol. 5, No. 1 (Spring 2014), pp. 27-57, at pp. 49-50 and 54-6). ‘Capturing the hearts and minds of the general public’ in ‘recipient countries’ is also an important task in the conduct of politics by military means. Even if one argues that DP programs are focused on process rather than ultimate outcome, a problem arises; the path and outcome of any regime transformation process is often unpredictable. Moreover, as Pinna notes, DP seeks to fundamentally transform all the institutions of state and society: the constitution, legal system, police forces, and bureaucracy. Political society’s political parties, according to Pinna and DP thought in general, are transformed through the training of party leaders and practitioners who choose leaders, recruit candidates, manage campaigns, and make policies. PD programs also work with the target state’s civil society, including private voluntary organizations, non-governmental organizations (NGOs), interest groups and professional associations, and independent media. What DP adepts may or may not ignore is that once liberalization or democratization processes begin, there is little to no control over where the institutions, political societies and civil societies of states targeted by such programs will lead. The vector would be all the more uncontrollable if the object of PD is to create a political crisis, and indeed Pinna acknowledges that this is precisely what the DP process aims for: “Because political parties participate in elections to acquire ruling incumbents, international actors tend to assist prodemocratic parties to bring about a crisis in the authoritarian regime and to encourage a democratic transition” (my emphasis from Pinna, “The International Dimension of Democratization: Actors, Motivations, and Strategies,” pp. 54-6). DP’s goal of inducing ‘a phase of political destabilization’ is what the Russians see in ‘color revolutions’ like that engineered in Kiev and elsewhere in Ukraine by Western-trained activists in winter 2013-2014. So Galeotti is correct in pointing out that the Russians noticed and responded in Crimea and Donbass with a color counter-revolution in spring 2014 using many of the technologies used in Western DP – mobilizational support for elements in society to overthrow of the regime or aspects of the existing order (Ukrainian sovereignty over Crimea), use of elections (referenda), and so on. Regarding the second type on non-linear war — the ‘political war’ of ‘dividing, demoralizing and distracting’ so that the opposite party cannot resist — is precisely what Western stratcomm, sanctions, and continuing DP are designed to create. Putin mixed these non-linear forms of ‘war’ with soft linear military action – the ‘polite little green men’ in Crimea and backing the Donbass revolt. Kiev was the first to use hard linear warfare by declaring war, its ‘anti-terrorist operation,’ against Donbass. However, there is not all that much new in hybrid war. It merely combines simultaenously long-known military and political means together with modern communications technology. The mode of both Russian and Ukrainian hybrid warfare emerges from: a long tradition of partisan warfare inherited from the Cossack and Russian experience of invasion, subjugation, and liberation wars, including both against against each other and together against Western powers; the Soviet experience in Afghanistan; and regarding contemporaneity, American – not Russian or Putin’s – modern military, technological, mass communications and strategic communications techniques. The All-Russian Ulema Council: A Step Towards a Unified ‘Rossiiskyi Islam’?